Play Rainbow Riches Reels of Gold Slot Online with 500 Free Spins! 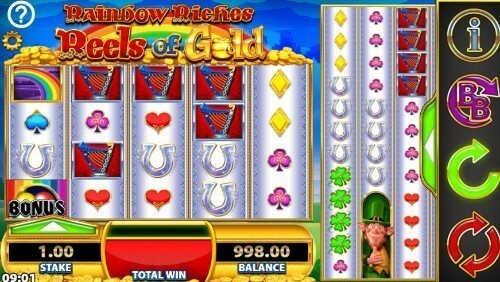 Rainbow Riches Reels of Gold is a UK Online Slot Game by Barcrest. This 5x4+5x12 layout, 100 betways game has an RTP of 96%. At any time during a reel spin a fairy Bonus can be awarded. The fairy will fly onto the screen and may award a Bonus. The game is rich in bonus features and gold, very much like the gold mine themed Bonanza slot game. Play bonanza slot UK today at Rose Slots and see if you can dig up some diamonds and gold. It is playable on any device of your choice too. Several qualities make this a truly exceptional slot game. One of these is the magical fairy. The fairy can reward you with seven bonus features. These extra features increase your likelihood of winning huge payouts. Barcrest created this video slot. It has several other gaming titles under its name too. It is one of the oldest developers of casino machines and games in the world. It has more than 50 years of experience in producing casino games. If you have enjoyed playing this game, you will probably like to play Rainbow Riches slot game and Rainbow Riches Pick N Mix slot as well. Be on the lookout for the Big Bet Mode too. This mode brings five linked spins to you. It also gives you 50 free spins. Imagine what you could win with all these additional spins as part of your arsenal while playing Rainbow Riches Reels of Gold! It has two sets of five reels; namely, 5 x 12 and 5 x 4 reels. What does this mean for you? Simply put, these reels increase your chances of winning. The fact the game has a feature that enables gamers to transfer wilds also makes it more likely for you to win. However, gamers can only transfer wilds when the Big Bet Mode is active. The minimum amount you can bet here is £0.01. The maximum amount is £500. That maximum betting amount already means you can play for huge payouts. It has a typical RTP of 96%, which games betting huge monies are guaranteed. The secret to playing this slot game and winning is to understand the bonus features fully. In addition to that, you also have to know how the Big Bet Mode works. If you like excitement when playing these types of slot games, then you will find Big Bet Mode will very attractive. Are there any symbols worth familiarizing yourself with? Know how and when to use each symbol as they all contain different values. Rainbow Riches Reels of Gold is a certified moneymaker. Barcrest fitted it with all the gaming features you need to guarantee yourself wins and money every time you play. These features make the game suitable for gamers who are unafraid of taking huge risks. Nevertheless, Barcrest may have designed the game in a seemingly tacky way. That shouldn’t bother you though. It may appear full of all the colors in the world too but that shouldn’t make you skeptical either. It has an incredibly slick game engine. For such a feature-heavy game, it’s surprising how well this game works. Fewer slot games in the world guarantee you wins the way this one does.